Rendering of the Axiom House. Courtesy Acre Designs. 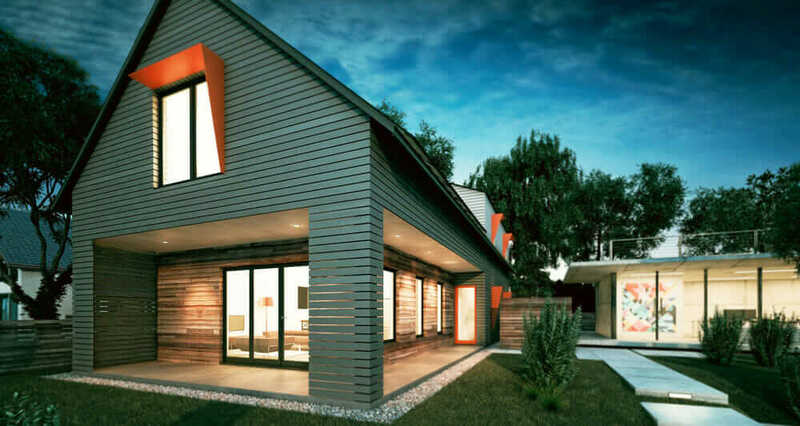 The Axiom House will take half the time typically required to build a four-bedroom, two-bath home. Plugged into the nation’s fastest commercial Internet service, nearly 40 monitoring systems in the Axiom will regulate temperature, oversee the safety of occupants, and dispatch robots to mow the lawn. 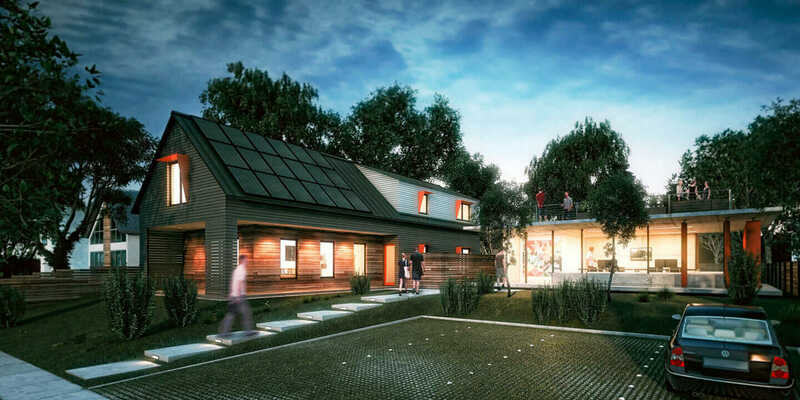 It’ll consume net-zero energy, with the combination of an ultraefficient building envelope, solar panels, and geothermal heating and cooling. And it will only cost $220,000 (not including the cost of the land). This all may sound like science fiction a shade too late for summer blockbuster season. 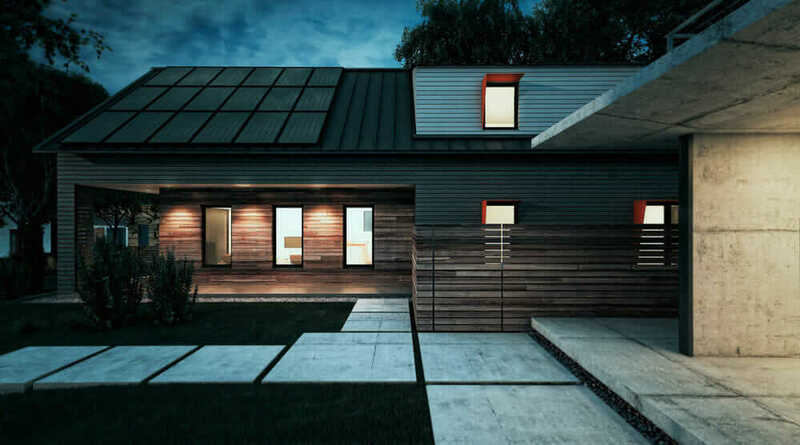 But come this spring, when Kansas City, Missouri–based Acre Designs completes the first Axiom House prototype, this model of a broadly affordable net-zero house and housing produced at scale will be put to the test. Acre cofounders Jennifer and Andrew Dickson will move into the house with their two children for 18 months, testing and refining the performance of their experiment every day. To make the house a reality, they are launching an Indiegogo campaign, with a baseline goal of $75,000, to help fund construction. But some potential clients have already put up their own money to get in line for an Axiom. Jennifer Dickson says they’ve collected eight $1,000 preorder deposits. 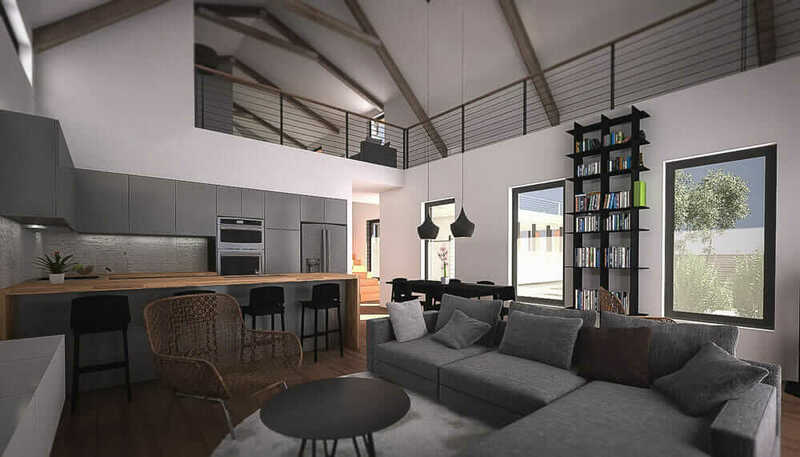 Rendering of interior. Courtesy Acre Designs. Currently, Acre is searching for developers, builders, and investors who can help them scale up enough to realize a viable business model. “Once we complete our prototype and start selling to the KC market, we are confident we will begin to see the true cost benefit,” she says. To move from a one-off prototype to a scalable template with modular elements, Acre is depending on the convergence of cultural and economic factors they hope will give them the leverage needed to remake the fragmented and inefficient home-building market. First, the lingering effects of the Great Recession, triggered by the collapse of the housing market, is making homeowners reevaluate what they want from a home. New home buyers want smaller, more efficient houses that aren’t measured by raw square footage, but by how well they perform in terms of energy use and sustainability. Second, Dickson says, the systems needed to make these projects a reality are plummeting in cost. Prices for photovoltaic panels, for example, have dropped 45 percent since 2010, according to the Solar Energy Industries Association. Rendering of exterior. Courtesy Acre Designs. Acre’s risky gamble is that these two trends are enough to break down the barriers to mass-produced modular housing that have taunted architects for decades. Architecture’s greatest minds have marched up this hill, struggling to reform a bloated and wasteful construction process that ships cut lumber to sites and then requires builders to recut the lumber. Home building is still a world apart from the way just about anything else is made, and it’s a decidedly sepia-toned place. “We’re still building in stick framing, which is from the 1830s,” Dickson says. 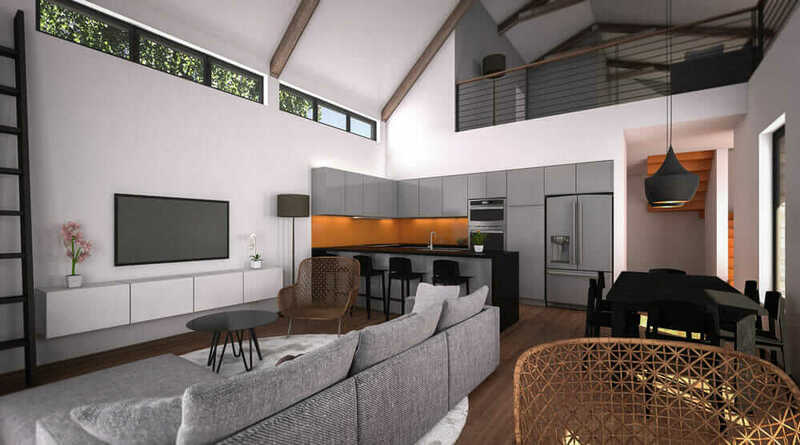 Designed with Autodesk AutoCAD and renderings in Autodesk 3ds Max, the Axiom prototype uses a traditional pitched-roof profile, covered in contemporary, richly textured materials. Exterior walls are rain-screened in fiber-cement siding. Natural wood and concrete are featured prominently, in addition to slanted sunscreens on the upper-floor windows. Inside, the interior is loft-like and breezy, with wood ceiling beams hefting up a double-height atrium. Acre has six floor plans to select from, ranging from one bedroom to five. Key to the home’s efficiency and low price are structurally insulated panels (SIPs), which are modular wall elements that combine structure, insulation, and sheathing. Acre estimates that the building envelope will help reduce energy consumption by 90 percent. In general, the Axiom template sacrifices time-intensive customization for money-saving, off-the-shelf replication. “By getting into an affordable price point, you make a much bigger impact on the environment because you’re repeating it far more times than one $300-per-square-foot, net-zero house,” Dickson says. Later iterations in different climate regions will have to be retuned for energy efficiency (and potentially made more expensive in pricier places than Kansas City), but for sheer winter-to-summer temperature extremes, Dickson says the Midwest is already an exacting test ground. And being in Kansas City has other advantages. It was the first city to get access to Google Fiber, which gives consumers download speeds of 1,000 megabits per second. Fed by blazing Internet speeds, the Axiom prototype will be located in the city’s Startup Village, a burgeoning hub for young tech firms—Axiom’s target customers. With a goal of modular, mass-produced, ultraefficient, and affordable homes, the design of the dwelling itself is probably less than half the battle. To make the vision a reality, Acre will have to rebuild the production stream that feeds the building industry. This begins with a website where buyers will select home features from a menu and see the results modeled in 3D. Next, a sorting warehouse will collect and arrange all of the building components, “containerizing” them in the exact order the builder will need to access them, Dickson says. This container is dropped on-site, and the builders go to work. Acre’s plan essentially grafts a few elements of off-site modular construction (SIPs and consolidated building elements) onto traditional on-site construction, making “existing home builders the distributed manufacturing workforce,” she says. Like all of architecture and prefab’s past flirtations, it’s a hybridized approach of making the home-building process more like the product-fabrication process, where Andrew Dickson’s primary professional expertise lies. Dickson says that people shouldn’t be worried about the rich’s access to quality design. Instead, she says, it’s time to turn attention to the broad swath of population living in wasteful, inefficient homes never touched by an architect. Click here to discover more of the latest technology trends in the construction industry from Redshift.